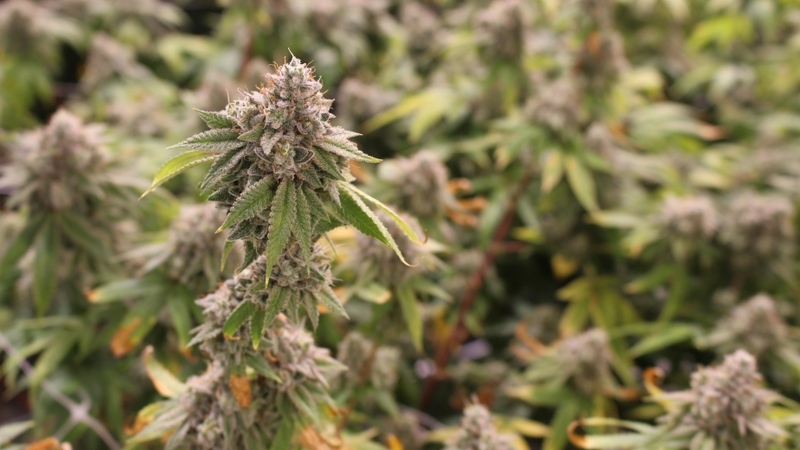 AKRON, Ohio – With the snip of a pair of pruning clippers, officials of Calyx Peak Companies welcomed their official entry into Ohio’s very young, but potentially explosive, medical marijuana market. “It’s a billion dollar-plus market here in Ohio, for sure,” said Edward Schmults, CEO of Calyx Peak Companies, based in Nevada. The company cultivated its first Akron harvest of medicinal marijuana Monday morning, as crop director Adrien Alvarez clipped a small bud from a mimosa cannabis plant before media, public officials and company executives. Calyx Peak’s Akron site started growing cannabis in October at a complex on Home Avenue that once served as the city’s sewer maintenance garage. The company was one of the 26 recipients of a state-sanctioned license that allows for the cultivation of marijuana for medicinal purposes. 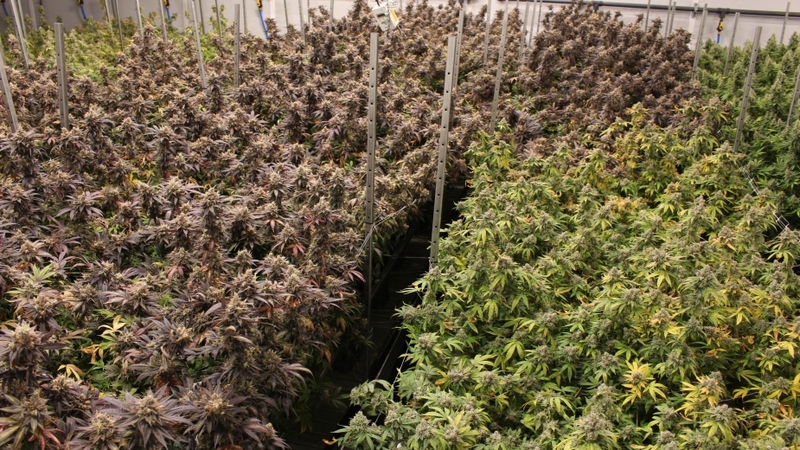 The facility has been renovated into an operation capable of housing thousands of plants that will be processed and delivered to dispensaries across the state, said Adam Thomarios, president of the local operation and executive vice president at Calyx Peak. Adam Thomarios, president of the local operation and executive vice president at Calyx Peak said the facility will eventually employ up to 60. About 25 employees work at the plant now, Thomarios said, but that number should scale up to about 35 workers over the next several weeks. “Eventually, we’ll probably be at capacity of 60 employees at this facility,” he said. Calyx Peak was on track to harvest 200 pounds of marijuana on Monday, Alvarez said. Going forward, he expects the facility to harvest about 250 pounds every two to three weeks, or between 4,000 and 5,000 pounds annually, he said. As a Level I grower, the site is allowed up to 25,000 square-feet of grow space initially and thus far uses about 16,000 square-feet, Alvarez said. The company has the option to expand to 50,000 square-feet next year and 75,000 square-feet as demand warrants, he said. Workers at Calyx Peak harvest some 8,000 plants that are derived from 120 “mother” plants. Media representatives were afforded a tour of the new facility. Before entering the grow rooms, visitors and employees must wear white protective Tyvek suits in order to prevent any outside contamination from entering the site. Each door in the facility is armed with a secure keypad and card reader that is open to authorized parties only, while about 100 cameras are positioned throughout the facility to monitor the operation. Some 120 “mother” plants serve as the seeds for the 8,000 or so plants that are harvested at the complex, Alvarez said. All that is required is to cut a small branch off one of the plants and place it in the proper hydroponic growing environment. A new plant should grow roots within 10 to 14 days, he said. Every two weeks, about 2,000 clones are drawn from the mother plants. Instead of pesticides, the company uses predatory insects that feed on any bugs that could damage the plants, he said. Alvarez, who has 20 years of experience in the industry, said the main grow room maintains a steady temperature of 77 degrees. This, along with a steady diet of water-based nutrients, help create consistency within the product. Such consistency is important when you are dealing with medical patients, he said. The plants use about 6,000 gallons of water per day. The Calyx Peak complex can produce 35 strains of cannabis. It will be sold in Ohio under the Song and Josh D brand names. The cannabis flower is then delivered directly to dispensaries across Ohio and sold to patients for vaporizing, he said. Once the company begins to process the product, it could be manufactured into tinctures, oils or chewable tablets. After harvest, the cannabis flower is cured, dried and tested, then delivered to dispensaries. Calyx Peak also owns dispensaries, cultivation sites and processing centers in California and Nevada, added company CEO Schmults. 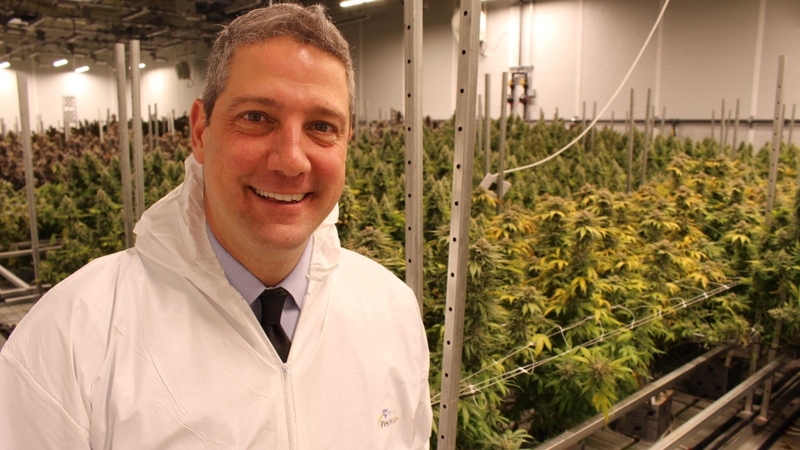 U.S. Rep. Tim Ryan, D-13, accompanied guests on the tour and said he backs the effort to develop a safe, medical marijuana industry in Ohio that gives patients an alternative to other types of pain medication such as opioids. The burgeoning Ohio medical marijuana industry creates more competition for big pharmaceutical companies, U.S. Tim Ryan said. “I believe there’s going to be a huge opportunity for us to really start addressing what’s happening in our communities with regard to opiates,” Ryan said. The industry also creates more competition with the big pharmaceutical companies, which have enjoyed enormous market share accompanied by higher costs for patients, he said. Mayor Dan Horrigan said the investment by Calyx Peak turned what was once a dilapidated warehouse into a productive employer. “We’re proud to be part of a growing industry and proud to support it,” the mayor said. 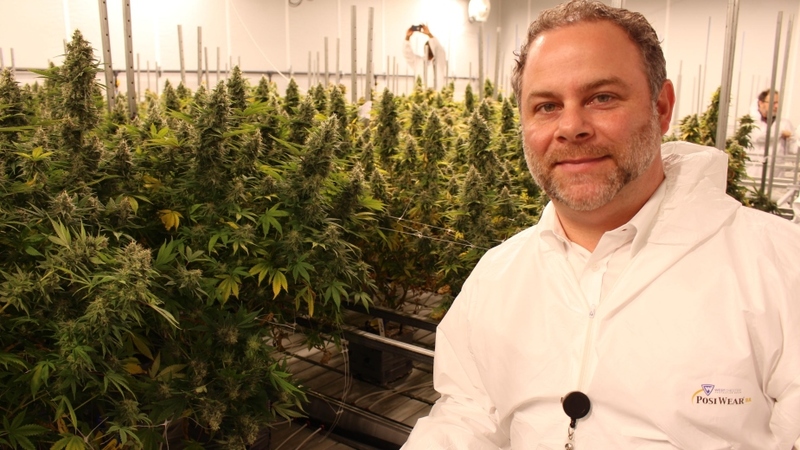 Pictured above: Crop Director Adrien Alvarez said he expects the facility to harvest up to 5,000 pounds of medical marijuana annually.